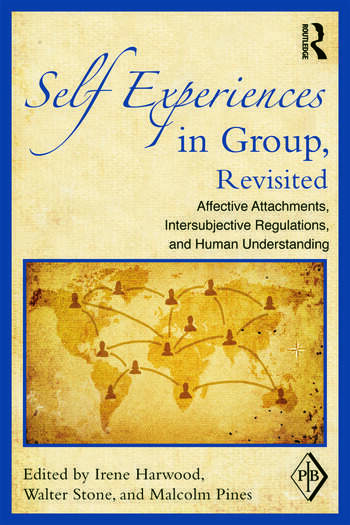 Since the publication of Self Experiences in Group in 1998—the first book to apply self psychology and intersubjectivity to group work—there have been tremendous advancements in the areas of affect, attachment, infant research, intersubjective regulation, motivational theory, neurobiology, philosophy, somatic understanding, and trauma. Carefully edited by Irene Harwood, Walter Stone, and Malcolm Pines, Self Experiences in Group, Revisited is a completely revised and updated application of self-psychological and intersubjective perspectives to couples, family, and group work, incorporating many of these recent findings and theories of the past decade. Divided into five sections, the contributors take an updated approach to the prenate and neonate in group; couples and the family in group; group theory, technique, and application; working with trauma; and group processes and artistic applications. Throughout, the reader is engaged in affectively understanding what is experienced by individuals in the regulation and dysregulation of self as part of the interpersonal relating, learning, and change that can occur in groups. Lichtenberg, Foreword. Harwood, Preface. Schlapobersky, Introduction. Part I: The Prenate and Neonate in Group. Thomson, Shared Experiences: The Prenatal Relational Model and Group Process. Harwood, Preventing Insecure Attachment: Integrating Infant Observation Studies, Attachment, Trauma, and Neurobiology in Clinical Interventions. Part II: Couples and Family in Group. Livingston, Sustained Empathic Focus, Intersubjectivity, and Intimacy in the Treatment of Couples. Kahn, Feldman, Relationship-focused Group Therapy to Improve Neuropsychological Regulation in Couples and Individuals. Feld, Working Intersubjectively with the Adult Family as a Group. Part III: Group Theory, Technique, and Application. Stone, The Curative Fantasy as a Protective Function in Group Psychotherapy. Livingston & Livingston, Sustained Empathic Focus and the Clinical Application of Self-psychological Theory in Group Psychotherapy. Segalla, The Therapeutic Work of the Group: Finding the Self through Finding the Other. Part IV: Working with Trauma. Shapiro, A Psychology of the Self Perspective on Working with Trauma in Group Psychotherapy. McLaughlin-Ryan, Posttraumatic Stress Disorder and Addictive Disorders: The Effects of Group Interactions on Affect/State/Intimacy and Isolation. Part V: Group Process and Artistic Applications. Thomson, Movement and Mindedness: Dance as a Group Process. Dluhy & Schulte, A Playful Approach to Group Therapy Education. Irene Harwood, MSW, PhD, is faculty and member of the New Center for Psychoanalysis and Assistant Clinical Professor in the UCLA Department of Psychiatry. She is also the past Director of Prevention of Insecure Disorganized Attachment at St. Joseph's Center and past President of the Group Psychotherapy Association of Southern California. Walter Stone, MD, is Professor Emeritus of Psychiatry at the University of Cincinnati, with an enduring interest in the application of self psychology to group psychotherapy and treatment of persons with persistent mental illness. He is the author or co-author of numerous articles and five books. Malcolm Pines, FRCPsych, DPM, is past President of the International Association for Group Psychotherapy and former consultant to the Tavistock Clinic and Maudsley Hospital. The former Editor of Group Analysis, he is the author of Circular Reflections (Jessica Kingsley, 1998).